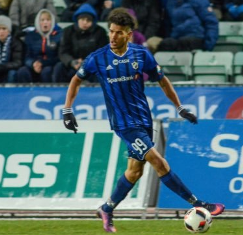 Former Norway U21 international Ohi Omoijuanfo registered his ninth league goal of the season in Stabæk's 1-1 home draw with Viking at Nadderud Stadion on Monday night. The visitors thought they had secured all three points but Ohi had other ideas and popped up with the equalizer in the fifth minute of second-half stoppage time. A deflection fell kindly for the striker and he drove the ball home from just outside the 18-yard box. The 23-year-old Omoijuanfo, who has been dubbed the new Emile Heskey, is the leading marksman in the Norwegian Tippeligaen, ahead of Aalesund's Abdellaoue. The former Manchester City trialist has notched two hat-tricks this season after ten matches in the division.